Above, members of the Artesia Fire Department and TriState CareFlight pose with Yeso Elementary School students during a field trip to the Public Safety Complex. 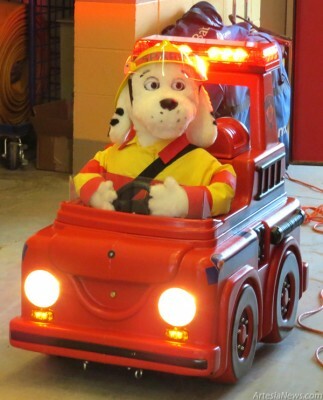 Below, the AFD’s new, interactive Sparky the Fire Dog character makes his way in to “speak” to the students. The Artesia Fire Department introduced Tri-State Care Flight and Sparky the Fire Dog, a Robotronics technology-based tool used to interactively educate kids, to Yeso Elementary School third-graders during a “Civic Pride” field trip. The first class present was instructed by Sonja Keim. … For the rest of the story, subscribe in print and on the web.